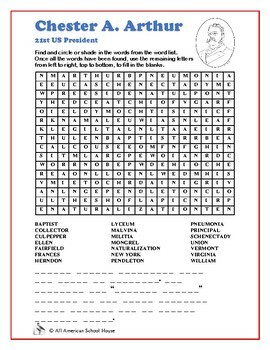 This two-page Word Search and Fill in the Blanks activity sheet is about the 21st President of the United States, Chester Arthur. 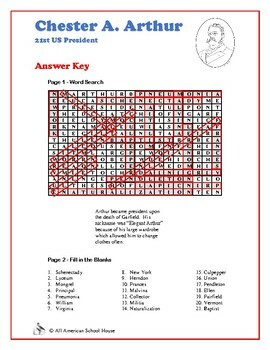 The first page is a word search with a hidden message. Once your students have found all of the words in the word search, they will use the remaining letters to fill in the spaces at the bottom of the page. The letters will then spell out an interesting fact about the subject! 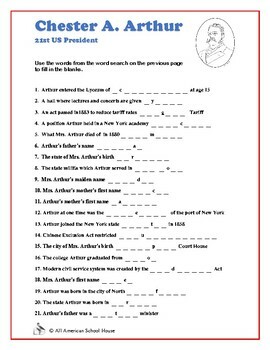 The second page is an optional fill-in-the blanks activity that uses the words from the word search list to let students know the meaning of each word or how it relates to the subject. Great no prep activity for U.S. President study, early finishers, or substitute folder! This product is also included in the U.S. Presidents Bundle, which includes all 45 U.S. Presidents at a super low price! Your feedback is appreciated! Thank you!